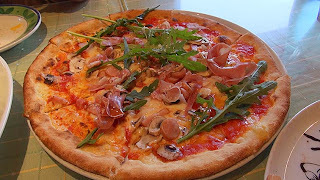 I became want to eat pizza for lunch on public holidays. The pizza of door-to-door delivery may be nice. But we need to buy ingredients etc. Therefore,we will dine out . 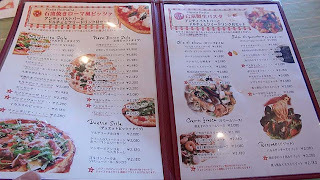 I do not know the delicious pizza house near the house. It does not understand, although I investigated on the website. I chose a popular chain restaurant where is located in a location that is some distance from home. There are two same chain restaurants in the same distance from a house. I chose the restaurant located in Takenoyama. The situation of this neighborhood changed. Long time ago,there was only a raccoon dog or a female college student. The chain restaurant of various kinds. There were also a hospital, a bank, and a laundromat. There is the staff of traffic control in parking. 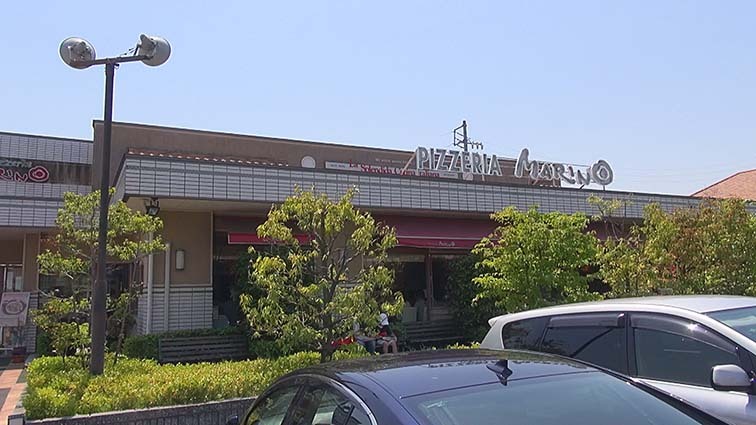 The pizza house which we chose. It was located here from before than them. Since we arrived a little early, the parking lot is vacant. Looks not have to wait. If ill-timed, it is necessary to wait. Water was carried after we had at a table. The carbonated water included in the bottle of blue glass is placed on the table. Dish is mainly pizza and a pasta. 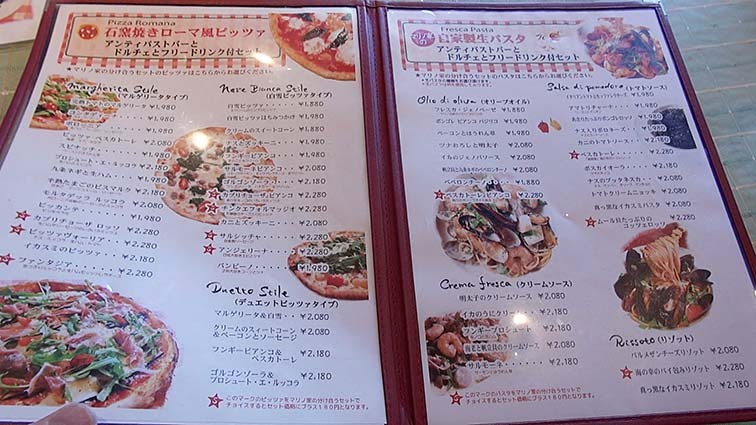 There is a set that can be selected one by one from the pizza and pasta. 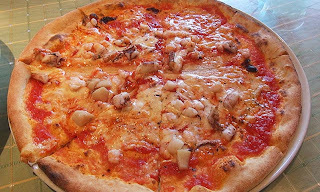 Pizza or pasta with appetizer and dolce set. An appetizer is a buffet style. We want to eat only pizza. The pasta of this restaurant is also delicious. Dried noodles or fresh noodles can be chosen. There is also a cream pasta of parmigiano. But I would like to eat pizza today. 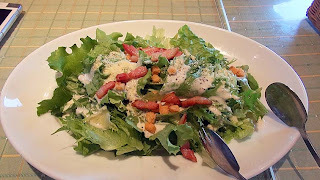 The Caesar salad was also ordered. The bacon of a Caesar salad is just fried. If the short-necked clam was contained in pescatore, I did not choose. A shrimp, a squid, and a scallop. The taste of a seafood is good. The seafood cut finely matches the taste of sauce and cheese. Capricciosa is a lot of meat. A sausage, bacon, uncured ham. It is full of processed meat product. The meat processed products has saltiness. Arugula’s light bitterness will match. I thought when I eat Pescatore, it's deep seasoning. But Capricciosa is more deep. It contains a little moisture. It was hang down when I have. But, It is a delicious part where there is sauce.